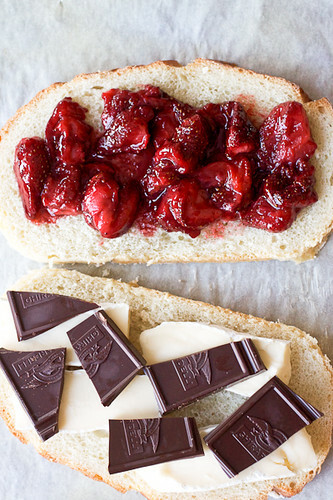 Roasted Strawberry, Dark Chocolate, and Brie Grilled Cheese Sandwich – The dessert sandwich of your dreams. Featured by Buzzfeed as one of the best! Guys, I promise you this is last indulgent recipe I’ll be bringing you for a [little] while. It’s been a busy few weeks here and it’s time to start moving back to some more of the healthy(ish) stuff. But not before you check out what’s going on with this recipe. This sandwich is a doozy! 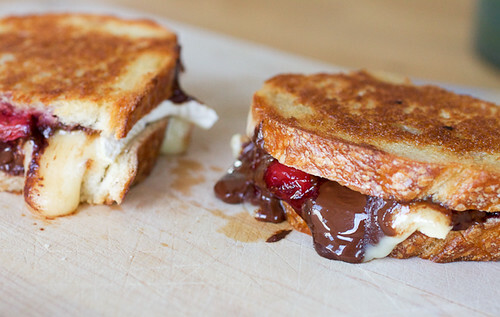 Layers of roasted strawberries, dark chocolate, and brie all melted together, oozing out the sides of a hot grilled sandwich. It’s ahh-mazing!! My hips are still struggling after this one, I swear. It’s easy to say that this is too over-the-top for lunch and I would agree – this sandwich is suuuper rich so consider this grilled cheese sandwich as a dessert as well…or even a dessert sandwich to share. It would be perfect for dessert since when you combine the ingredients in duo combinations, they all work really nicely for dessert (strawberries and chocolate, chocolate and cheese, cheese and strawberries) which obviously means that the trio works as well. 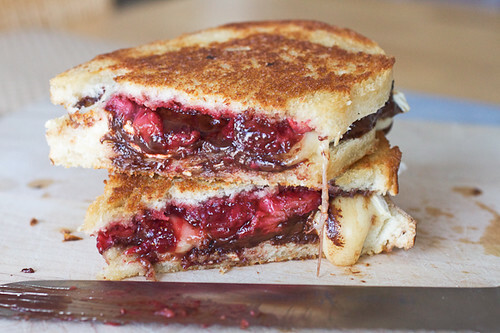 I’m sure there’s some logic equation that would show that I can’t assume a trio would work if the duos work independently but just trust me here: this roasted strawberry, dark chocolate, and brie grilled cheese is a KILLER sandwich. Screw the math. 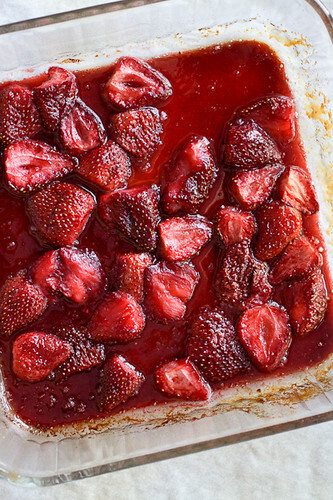 The strawberries are slow-roasted in some maple syrup, sea salt and olive oil and then you’ll drizzle a wee bit of port wine over the hot strawberries. Much like tomatoes, the strawberries break down in the oven and deepen in flavor when roasted. They end up being a glorious treat on their own (or you know, when you top a biscuit with them) so to add them to a grilled cheese sandwich with brie and dark chocolate only elevates the hell out of them. Let me tell you, I’m certainly getting my money’s worth at the gym this month! The key to easily melting the chocolate and cheese for these sandwiches is to cover the pan while they are toasting. This traps the heat inside the pan and helps with the melting factor! To make the roasted strawberries: Preheat oven to 350° F. Lightly grease an 8×8-inch baking dish. Whisk the maple syrup, olive oil, and salt together in a medium bowl. Toss the strawberries in the syrup mixture until they are well-coated then lay them out in a single layer in the prepared baking dish. Roast for 40 minutes, tossing the strawberries halfway through the baking time. Remove the dish from the oven and drizzle the port wine over the strawberries, mixing to combine. Set aside. To make the sandwiches: Butter one side of two slices of bread. Heat a large non-stick skillet over medium heat. Place half of the brie on the un-buttered side of one slice of bread. Lay half of the chocolate on top of the brie. Layer on half of the roasted strawberries on top of the chocolate then top with the second piece of bread, butter side up. Place the sandwich in the skillet. Repeat with the second sandwich. Cover the pan with a lid or sheet of aluminum foil for about 3 minutes; this will ensure the heat melts the cheese and chocolate. Remove the lid (or foil) and check the undersides of the sandwiches with a spatula. If the bread is lightly browned, flip the sandwiches to finish off the other sides. When both sides of the sandwiches are perfectly browned (you know what that looks like) and the cheese and chocolate is just melted, remove them from the pan, cut, and serve hot and gooey. This sounds like the perfect trifecta of ingredients – chocolate, strawberries and cheese! Yum! That chocolate oozing out the sides is killing me!! I’ve never had roasted strawberries, I need to get on this asap. ummm, WOW. how decadent & amazing. Love this combination of flavors for a grilled cheese! Cheese and Chocolate… what more could a gal want?!? Holy moly, I can’t even fathom how good this sandwich is! So decadently delicious! This was delicious as Sunday brunch. I am definitely making this again. Mmm…Sunday brunch – great idea!